Lewis Freestone (right) is in the Posh FA Youth Cup squad. Peterborough United manager David Farrell insists his young team won’t need motivating for a tough FA Youth Cup first round tie against local rivals Cambridge United at the ABAX Stadium tonight (October 31, 7pm kick off). Posh will start as underdogs having lost twice to Cambridge in Youth Alliance League fixtures already this season, but Farrell believes Saturday’s (October 28) 2-0 win over Luton has given his side valuable momentum. Posh youth team manager David Farrell issues instructions to his players. “It’s the FA Youth Cup, it’s under lights at the first-team ground and it’s against Cambridge United so motivation won’t be a problem,” Farrell stated. “We know we have a tough game as Cambridge have deservedly beaten us twice this season, but this is the FA Cup, a one-off tie under very different circumstances. We are more than capable of getting a positive result. “There’s been a real furore around the place since the draw was made. This is a big deal for my team, but I have been impressed with how the players have kept their focus in the two games we’ve played since the draw was made. Young Posh centre-back Sam Cartwright in action for Posh in a first-team friendly. Farrell has included players with Posh first-team experience in his 20-man provisional squad. 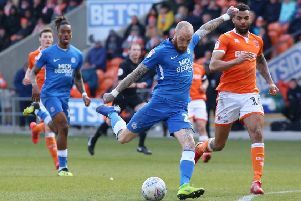 Left-back Lewis Freestone and midfielder Andrea Borg played for Posh in League One at the back end of last season, while Kasey Douglas made a brief Checkatrade Trophy appearance at Barnet last November. Central defender Sam Cartwright was awarded a professional contract last month, while Posh have high hopes for midfielder Harrison Burrows. Midfielder Luke Strachan is reportedly a transfer target for Championship clubs Birmingham City and Aston Villa. The tie will be decided tonight with extra time and penalties to determine the winner if required. Posh have lost to non-league opposition in the FA Youth Cup in each of the last two seasons. They lost at Dereham in 2015 and Oxford City last season. It’s just £3 admission (£1 concessions) tonight. Posh: (from) Lewis Elsom, Josh Allen, Aaron Hart, Mikkel Fosu, Sam Cartwright, Frazer Garner, Rio Douglas, Lewis Freestone, Kyle Barker, Layton Maddison, Luke Strachan, Mo Hamza, Jack Gurney, Andrea Borg, Harrison Burrows, Josh Davison, Harry Brookes, Ewan Fieldhouse, Oliver Shackelton, Kasey Douglas.